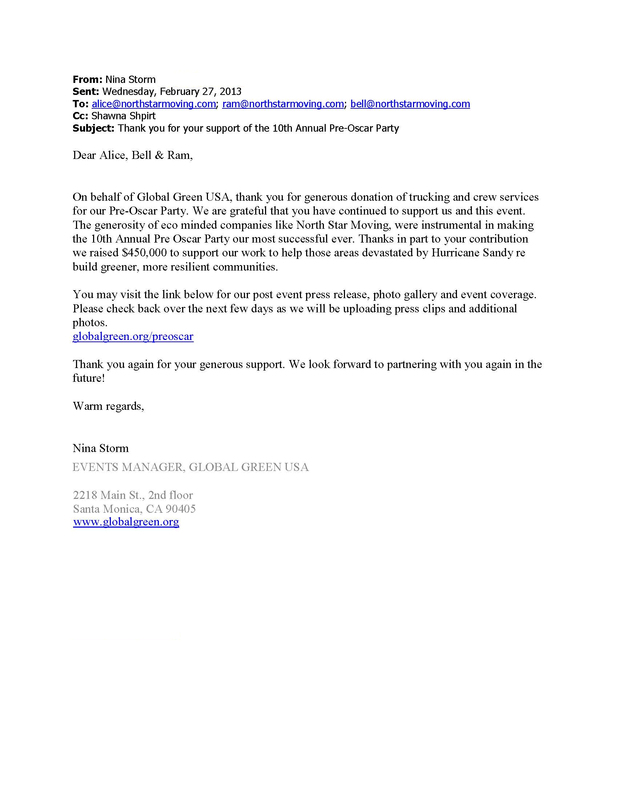 On behalf of Global Green USA, thank you for generous donation of trucking and crew services for our Pre-Oscar Party. We are grateful that you have continued to support us and this event. The generosity of eco minded companies like North Star Moving, were instrumental in making the 10th Annual Pre Oscar Party our most successful ever. Thanks in part to your contribution raised $450,000 to support our work to help these areas devastated by Hurricane Sandy re build greener, more resilient communities. You may visit the link below for our post event press release, photo gallery and event coverage. Please check back over the next few days as we will be uploading press clips and additional photos. Thank you again for your generous support. We look forward to partnering with you again in the future!